Mother of two Michelle Jankovic is one of five top businesswomen to be selected as a finalist for two categories at the 2012 AusMumpreneur Awards. 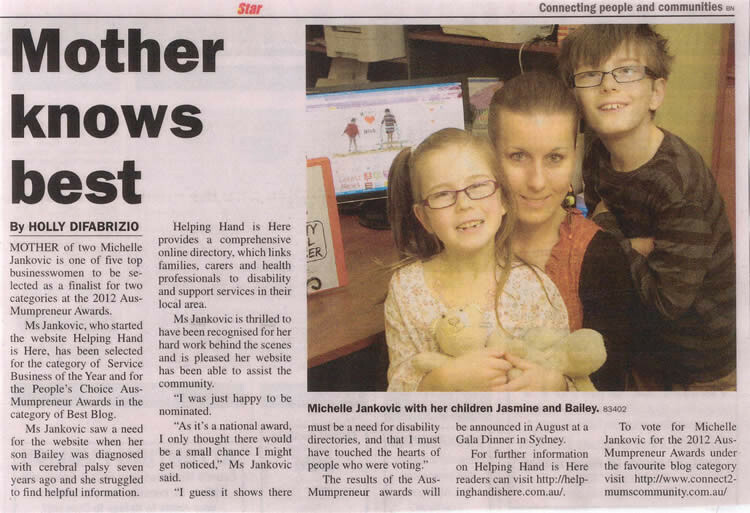 Ms Jankovic, who started the website Helping Hand Is Here, has been selected for the category of Service Business of the Year and for the People’s Choice AusMumpreneur Awards in the category of Best Blog. Ms Jankovic saw a need for a website when her son Bailey was diagnosed with cerebral palsy 7 years ago and she struggled to find helpful information. Helping Hand Is Here provides a comprehensive online directory, which links families, carers and health professionals to disability and support services in their local area. Ms Jankovic is thrilled to have been recognised for her hard work behind the scenes and is pleased her website has been able to assist the community. “As it’s a national award, I only thought there would be a small chance I might get noticed,” Ms Jankovic said. The results of the AusMumpreneur awards will be announced in August at a Gala Dinner in Sydney. For further information on Helping Hand Is Here readers can visit www.helpinghandishere.com.au. To vote for Michelle Jankovic for the 2012 AusMumpreneur Awards under the favourite blog category visit www.connect2mumscommunity.com.au.